Autoriza digital de imagens do plano de fundo indesejado em lote. Foto de plano de Fundo Removedor de ajuda para limpar digital de imagens do plano de fundo indesejado em lote. A remoção Manual é realizada com o objectivo de duas marcas: um marcador vermelho é usado para definir o plano de fundo da área que vai ser removido, enquanto marcador verde seleciona a área que vai permanecer intacta. Automático de remoção de plano de fundo não necessita de quaisquer ajustes manuais, o programa irá limpar uma imagem por si só. O programa também possui marca d'água de proteção. 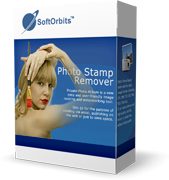 Photo Stamp Remover é um utilitário de correção de fotos que pode remover marcas dágua, carimbos de data e outros objetos indesejados que aparecem nas fotografias. Com um processo totalmente automático, o programa utiliza uma restauração inteligente para preencher a área selecionada com a textura gerada a partir de pixels, de modo que o defeito se mistura com o resto da imagem naturalmente. O que levaria horas para corrigir usando uma ferramenta de clonagem pode ser feito em minutos usando o Photo Stamp Remover. 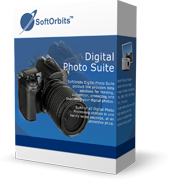 Another SoftOrbits program. My advice avoid all software by this company. I have tried they’re programs over the last decade and the amount of blue screens of death they’ve given me over the years is stupidly high. I remember at one point one of they’re programs contained some sort of Maleware/adware/spyware/rootkit as I had to use another program to remove its install folder as nothing I could do could remove it. Just saying this lot are a bunch of scammers. Is they’re any surprise that this is the same giveaway year after year. Data haversting, and forcing installs, whilst making it impossible to remove. No thank you. Where are SoftOrbits based? China wouldn’t surprise me. Avoid any program by this lot like the plague. And if you really want something to remove artefacts or back grounds or even red eye from a photo, try paint.net, it’s easy please, and doesn’t involve taking control of your information with out you knowing. Richard Sebire, Never had these issues you"re talking about. The problem I had with some SoftOrbits giveaways in the past, is that the licence deactivates itself after a few months. Funny that today's program is sold 570 RUB (9 USD) on russian sites, and here it's supposed to be sold 50 USD ! Same version as the giveaway last August, (3.2). You can get better results of removing background by a simple photo editor than this one. Third, the part of the background always leave traces on the edges and parts you want to keep can overlap with the parts you are removing. Enlarge the part you want to extract, outline it with white marker and then copy it from the image and paste it in a new picture with no background, enlarge the image again and remove the residue from the edges. This can give you 100 times better results and the extracted part becomes independent from the previous picture and can be inserted in any kind of background you want or leave it as is. You can get better results of removing background by a simple photo editor than this one. First this software does not allow pixel by pixel outline, Second, the shadows from the background falling on the part you want to keep can not be removed, Third, the part of the background always leave traces on the edges and parts you want to keep can overlap with the parts you are removing. Better results with any photo editor can be done this way: Enlarge the part you want to extract, outline it with white marker and then copy it from the image and paste it in a new picture with no background, enlarge the image again and remove the residue from the edges. This can give you 100 times better results and the extracted part becomes independent from the previous picture and can be inserted in any kind of background you want or leave it as is. I downloaded this program last time and I have used it to my satisfaction. 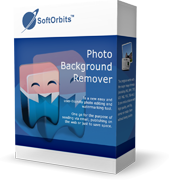 This is a beginners software that works well for basics and occasional use to trim something out but it is not aimed at advanced/ professional users who will no doubt use a better and much more expensive software. The sceret of successful use seems to be to considerably enlarge the picture for the changes and then it looks acceptable when returned to normal size. If the program is used on a normal size picture the results can look quite ragged. They are a Russian company but then so are Kaspersky who are one of the market leaders in security software. I am not a supported of Russia in any political sense. Their actions on the world stage are deplorable and I understand if some people refuse to use their products because of this. Russia has some very good programmers who produce good software. They also seem to have some programmers who use their skills for negative reasons but then so do some other nations as evidenced by the recent Facebook scandal. There is a capacity for any software to include harmful elements which means that there is a risk using ANY software. To be honest I do not know who to trust so my policy is to be as careful as I can in the source, software, installation and permissions. I downloaded this program last time and I have used it to my satisfaction. 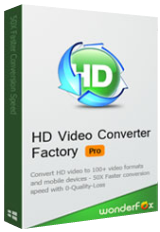 This is a beginners software that works well for basics and occasional use to trim something out but it is not aimed at advanced/ professional users who will no doubt use a better and much more expensive software. The sceret of successful use seems to be to considerably enlarge the picture for the changes and then it looks acceptable when returned to normal size. If the program is used on a normal size picture the results can look quite ragged. Perhaps I am lucky in that I have never had a problem with Soft Orbit programs ( finger crossed!) They are a Russian company but then so are Kaspersky who are one of the market leaders in security software. I am not a supported of Russia in any political sense. Their actions on the world stage are deplorable and I understand if some people refuse to use their products because of this. Russia has some very good programmers who produce good software. They also seem to have some programmers who use their skills for negative reasons but then so do some other nations as evidenced by the recent Facebook scandal. There is a capacity for any software to include harmful elements which means that there is a risk using ANY software. To be honest I do not know who to trust so my policy is to be as careful as I can in the source, software, installation and permissions. Peter: Worrying about a software publisher's CoO (Country of Origin) isn't worth it. Many publishers can, and do, obfuscate details of their website domains and cite office locations in an entirely different country. Some software publishers don't even exist: they're the trading fronts of a single producer offering re-badged products. Others charge tax on goods bought even though they pocket that tax. The list goes on . . . Your fears in regard to Russia are a latter-day reflection of those about China, when it was (allegedly) the Evil Empire. A degree of paranoia also existed about former Soviet bloc countries as well as India. Yet as you rightly say, there are some superb Russian developers. Just as there are some superb Chinese developers. Ditto former Soviet bloc and India. Unless it's a verifiable fact that any software I'm about to try comes from North Korea, then I'll just exercise routine prudence and not bother about CoO. As to today's offer: you're correct about the need -- always -- to enlarge images when doing this kind of work. It's also wise to check out different developers (regardless of origin) because a user's success greatly depends on how clever a developer's algorithm might be. Despite the proliferation of pixel-shifting / seam-carving software out there, not all programs offer the same performance because not all developers have the same ability. Peter: Worrying about a software publisher's CoO (Country of Origin) isn't worth it. Many publishers can, and do, obfuscate details of their website domains and cite office locations in an entirely different country. Some software publishers don't even exist: they're the trading fronts of a single producer offering re-badged products. Others charge tax on goods bought even though they pocket that tax. The list goes on . . . Your fears in regard to Russia are a latter-day reflection of those about China, when it was (allegedly) the Evil Empire. A degree of paranoia also existed about former Soviet bloc countries as well as India. Yet as you rightly say, there are some superb Russian developers. Just as there are some superb Chinese developers. Ditto former Soviet bloc and India. Unless it's a verifiable fact that any software I'm about to try comes from North Korea, then I'll just exercise routine prudence and not bother about CoO. As to today's offer: you're correct about the need -- always -- to enlarge images when doing this kind of work. It's also wise to check out different developers (regardless of origin) because a user's success greatly depends on how clever a developer's algorithm might be. Despite the proliferation of pixel-shifting / seam-carving software out there, not all programs offer the same performance because not all developers have the same ability.